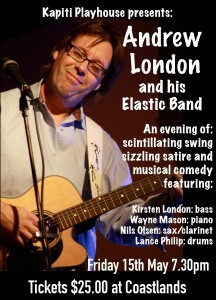 Andrew London returns to Kapiti Playhouse - Kapiti Playhouse Inc.
After a year of constant touring and recording with his trio, singer/songwriter Andrew London presents a show on May 15th at the Kapiti Playhouse that represents a ‘best of’; songs selected from an enormous repertoire of satirical and humourous material the trio draw from for their shows. The evening will be recorded for a live album and possible DVD release. The song titles give some idea of what to expect: ‘Speed Up at the Overtaking Lane’, ‘I Hugged My Mate’, ‘Country’s Buggered’, ‘Don’t You Know Who I Am?’ – all whimsical songs that reflect the national psyche with gentle irreverence, and playfully lampoon many of New Zealand society’s obsessions and taboos. Themes run the gamut from DIY, social media, politicians and weddings to male insecurities, technophobia, youth culture, household appliances, road rage, and various other issues of concern to the average middle-aged, middle-class Middle-Earth-dwelling Kiwi. “There are songs that go down well in Hokitika that just don’t work in Ponsonby, and vice versa” he says. “Of course the trick is choosing the right ones for the right audience’. Recent reviewers both here and in the USA have compared him to Fred Dagg, Flanders and Swann… even Noel Coward, and after a recent appearance live on National Radio’s Afternoons Live show, one commentator remarked “you guys are like Flight of the Conchords for Rest Homes”. With collaborators Nils Olsen (sax & clarinet) and Kirsten London (bass) the band give a run-down on the ‘State of the Nation’, exploring our deeply held social conventions and forcing us to laugh a little at ourselves…no small thing these days. “We like the audience to feel as if they’ve been invited in for a cuppa and a good old gossip about how things were different ‘back in my day’”. Special guests Wayne Mason (piano) and Lance Philip (drums) have been roped in to help out on the night. 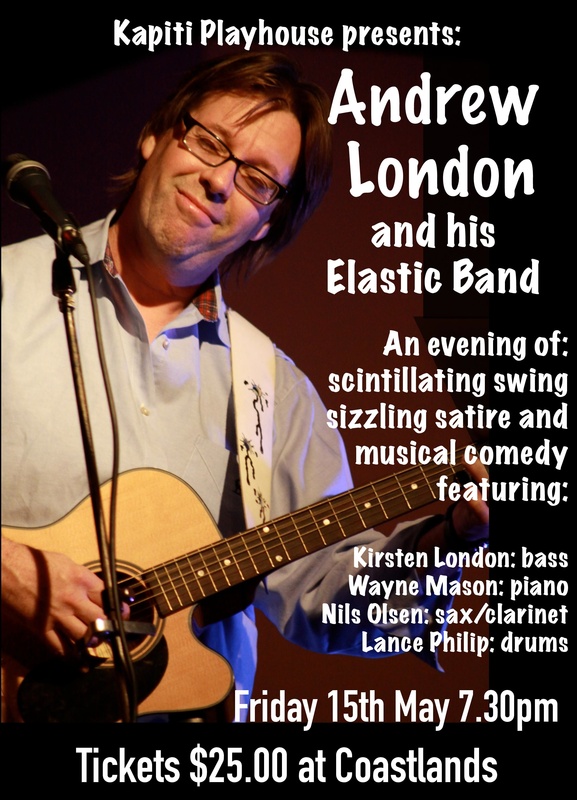 Andrew London and Friends play at Kapiti Playhouse Theatre, 7 Ruahine Street, Paraparaumu, on Friday 15th May at 7.30pm. Tickets cost just $25 and are available at Coastlands or via the TicketDirect website (please note that online bookings may attract additional fees).